A Melancholy Note is Quadidra S. William’ first novel. The story follows Kalyia, a lonely, isolated seventeen year old girl, through the ups and downs of her relationship with Shadeem, a charming musician with a dark side. Set in Philadelphia, the novel features a diverse case of primarily black and Hispanic young adults trying to find their places in the world and with each other. Kalyia is in high school when she meets Shadeem, living with the grandmother who raised her and looking for a place to belong. Shadeem makes her feel like a part of something exciting, and despite some clear warning signs she falls head over heels for him. 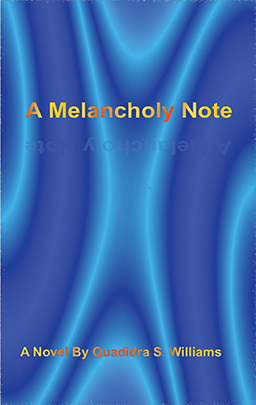 A Melancholy Note traces their relationship through Kalyia’s college experience, an unplanned pregnancy, a shotgun wedding, infidelities, and family tragedies, all of which contribute to an increasingly tense and fragile peace between the two which escalates to a shocking conclusion. As the dynamic between Kalyia and Shadeem unfolded, I was a bit concerned that A Melancholy Note was going to be one of those books jumping on the 50 Shades of Grey bandwagon, fetishising and glorifying abusive relationships. However, Williams does a commendable job of exploring the intricacies of domestic violence and the effect that the cycle of abuse has on everyone that comes into contact with it. While abuse is always wrong regardless of provocation, neither Kalyia nor Shadeem are innocent victims in A Melancholy Note. Both main characters are guilty of abuse in different ways, both physically and emotionally. Kalyia and Shadeem are both cheaters, both manipulative, and both prone to violent outbursts. Neither of them had healthy models of adult relationships as children, and as a result they have an extremely dysfunctional marriage. While A Melancholy Note is relatively well written, it is still easy to see that it is a first novel, and one that was self-published. It begins with a short essay by the author’s husband which encourages readers to “just do you!” There is also a poem, free-verse and unpunctuated. I found the beginning of the book very confusing, because Williams has labeled the first chapter “Introduction.” I began reading it assuming that it would be a standard introduction and was perhaps an anecdotal story about Williams’ own life. It soon became clear that that was not the case and the chapter continued on for what Kindle tells me is 20% of the book. While Kalyia and Shadeem are both from broken homes, they are never short on cash and always achieve their dreams in a way that just feels too simplistic in the present economic climate. Their baby, Sha, also comes across as an obvious plot device, a way to move along their relationship. After he is born, he spends the majority of his time with Kalyia’s grandmother or with Shadeem’s sister-in-law while Kalyia and Shadeem blithely go about their now married lives. At times, since the book is spanning a number of years, it feels like there is a lot of detail being glossed over and the day to day details are ignored in favor of the bits of high drama that are the focus of the book. I chose to give this book a rating of 3 out of 4 stars. Despite some minor issues I had with the story, the overall plot is engaging and will keep readers coming back for more. This is definitely not a story for the faint of heart or someone looking for a happily ever after, but the story is the perfect fit for anyone who loves urban fiction with a dark side.